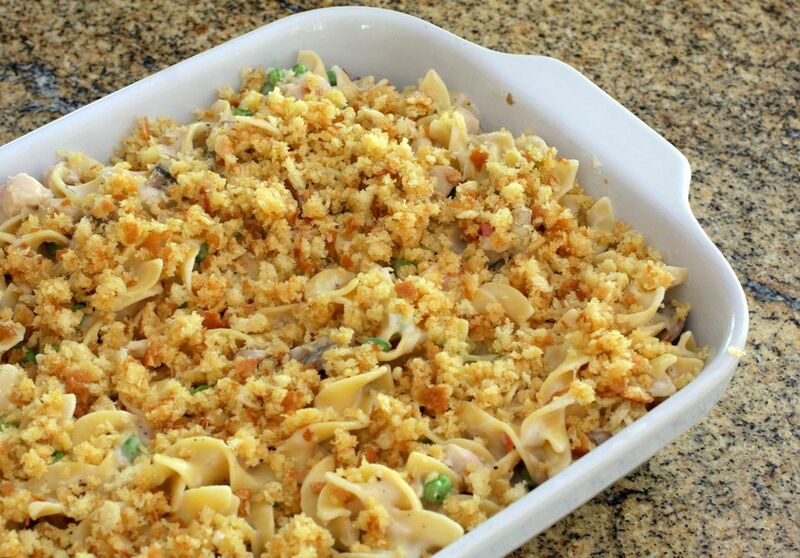 This classic tuna casserole is a classic mixture of tuna, noodles, and a flavorful homemade sauce–no soup! We used frozen thawed peas in this dish, but feel free to use lightly cooked frozen mixed vegetables or a blend of peas and carrots. If you aren't a fan of mushrooms, leave them out, or sauté some onions or celery to replace them. To serve, complement this creamy casserole with a tossed salad or fresh sliced tomatoes and cucumbers. Heat the oven to 350 F/180 C/Gas 4. Lightly butter a 2-quart baking dish or spray with cooking spray. Cook the noodles in boiling salted water following package directions. Drain in a colander and rinse under hot water. Meanwhile, in a medium saucepan over medium heat, melt 4 tablespoons of butter. Cook the sliced mushrooms until golden brown and tender. Then stir in the flour. Cook, stirring, for about 1 to 2 minutes. Gradually add the milk and continue to cook, stirring, until thickened. Stir in the mayonnaise, frozen peas, tuna, and drained pimiento. Bring to a simmer and continue cooking, stirring, for 1 minute longer. Combine the sauce mixture with the noodles and mix to blend ingredients thoroughly. Turn into the prepared baking dish. In a small bowl, combine the bread crumbs with melted butter. Bake for 25 minutes, or until the casserole is bubbly and topping is browned. As loaf bread becomes stale, tear it into pieces and process in a food processor until finely ground. Freeze the crumbs in a food storage bag and use as needed for casseroles or other dishes calling for bread crumbs, like meatloaf. For toasted breadcrumbs, spread the crumbs out on a rimmed baking sheet and bake in a preheated 325 F (165 C/Gas 3) oven for about 12 to 14 minutes, until browned and crunchy. Substitute French fried onion rings or potato chips for the buttered breadcrumb topping. Instead of mushrooms, sauté 1/2 cup of thinly sliced celery or a combination of celery with 1/4 cup of chopped onion. Add 1 cup of shredded cheese to the thickened sauce before you add the mayonnaise.